Thank you for your interest in the water structuring units produced by Natural Action Technologies, Inc. and inventor Clayton M. Nolte. Click here to read about the benefits of structured water. Here are the NAT products that you can purchase from us. Good News! The NAT product prices below are 20% off of retail. The Portable structured water machine is the answer when you want to enjoy the benefits of an energy infusion of structured water when you’re out and about, whether around town, at a local restaurant, or on the road traveling. Simply pour your water through the top end (funnel end) of the unit, and it comes out structured through the spout end at the bottom. Power-packed. Half the structuring ability of a whole house unit packed in a tiny package. The canister and interior flow-form is made from food grade plastic used for kitchen appliances and is easy to clean and maintain. Lightweight, make it easy to carry when you are on the go, in backpacks, purses, luggage, lunchboxes, and more. It drains easily from either end, and can be stored with either end up. Backed by a 90 day money back satisfaction guarantee, and a lifetime warranty. 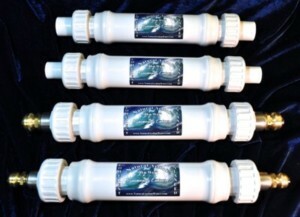 When traveling, use your portable structured water machine for structuring your drinking water. Can be used as a portable unit. Take it with you when you travel. Shown with Super Shower Unit. The Shower Unit is a convenient way to enjoy the healthy benefits of bathing in structured water. It is easily removed to take with you when traveling. Simply screw off your existing shower head, screw our unit on the pipe, then screw your shower head back on to our shower unit. Water for filling containers, and many other uses. FYI: Hydrogen is absorbed by carbon, so when you have a carbon filter for your drinking water, it can lower the pH of the water by about 1 point. For instance, if your tap water normally has a pH of 7, structuring the water could drop the pH to 6. The Garden Unit is a convenient way to bring Structured Water to your plants and garden. Simply connect it to a faucet and hook up your hose. Garden units are easily connected to a recreational vehicle for filling water reservoirs while traveling. Great for use on hot tubs, too! Extraordinary results are being obtained by watering plants with Structured Water. Use it in your greenhouse or on an aquaponics system. For the Garden unit to effectively Structure Water any distance will work, however, the greater the pressure, the greater the efficiency. Thirty pounds per square inch (PSI) is an average pressure. If less than that, structuring will still be effective. An optimum pressure is fifty PSI +. The Natural Action Technology’s Under Sink unit has a 4% increase in Bio-Photon energy over the Shower; the Home unit has a 13% increase in Bio-Photon energy over the Shower unit. The Shower unit’s water is direct contact, no loss, the Under Sink water has to deal with stuff and that stuff is energy consuming. A House structured water machine is a wonderful way to have structured water throughout your home, and available in the kitchen, bathrooms, showers, and garden areas of your home. For showering and bathing in. Enjoy Structured Water throughout your home. For Pipe Sizes: 1/2″, 3/4″ and 1″. An installation guide comes with every NAT structured water machine. This structured water machine is great for farm use, commercial building use, landscaping uses, etc. Weight: Varies depending on connector type. Approx 5 lb, 1 oz. An installation guide comes with every NAT Water Structuring Unit.